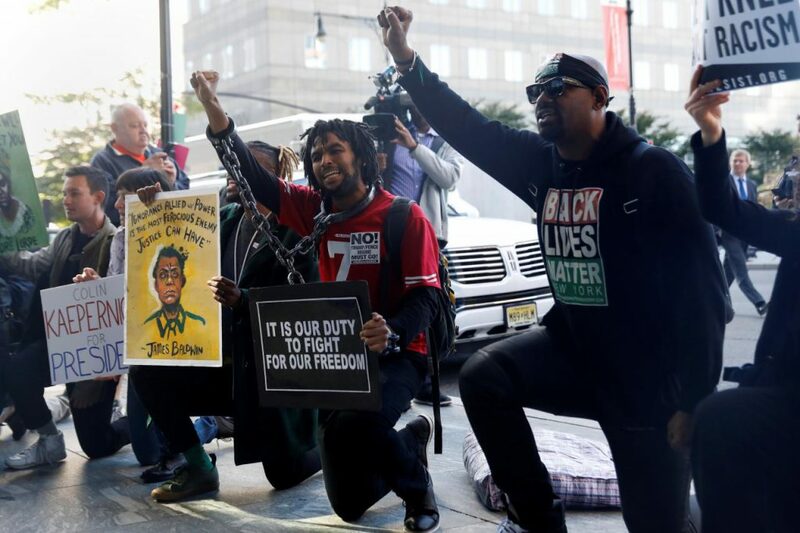 New Orleans The National Football League continues to hope that they can outlast the players and their use of their “platform” to communicate their deep feelings about the state of racial injustice and police brutality in the country, but it’s not going away. In fact it seems fueled by the owners failure to understand the depth of the players’ feelings. Furthermore, the players protest is also hurting the White House now. Six players visibly protested at the game between the San Francisco 49ers and Philadelphia Eagles, The Associated Press reported, and Los Angeles Chargers offensive tackle Russell Okung raised a fist during the anthem before a game in Massachusetts. During a game in London, nearly all members of the Minnesota Vikings and Cleveland Browns stood arm-in-arm for the playing of “The Star-Spangled Banner” and “God Save The Queen.” … a majority of Houston Texans players knelt and locked arms during the anthem. While some team members had protested previously, this week’s demonstration appeared to be in response to owner Bob McNair’s comments in an ESPN The Magazine article saying “we can’t have the inmates running the prison,” in reference to prior protests. About ten players stood with their hands over their hearts, according to The Houston Chronicle. Ok, not a mass movement for sure, but effective all the same. The latest Wall Street Journal/NBC poll found that only 30% of Americans overall approved of President Trump’s handling of the NFL protest. Of course Trump’s overall approval was a record low at 38%, but the protests were among his lowest scores, partially because he’s fighting a battle he can’t win. He’s not the only rich, high-riser who is out of touch though. Houston Texan’s owner, Bob McNair, clearly didn’t get it at all, but neither did Dallas Cowboys owner, Jerry Jones. One tried, ham-handedly to mouth off as a boss, and the other tried playing the schoolyard bully. Both were forced, likely by their coaches, to have to appear at a captive audience meeting with their players to back off their comments. Those were powerful, silent protests behind the pay window from the fans and the media glare, but the fact that they happened at all is proof of the power of the protest and the depth of its support. There’s also no peace on the field that is likely forthcoming. Organizers and leaders of the current protests, only a week after an attempt at a reconciliation effort to co-opt the players in a meeting brokered by the league and the union with the owners in New York City, last week publicly complained that they were disappointed in the lack of progress and movement on these issues. The McNair flareup will sharpen their critique, and start to pry the lid off of the effort to compromise and upgrade the league’s profile of work in the community. Protests, large or small, loud or quiet, never really end until there is real change, and none is evident at this point.